The roadside signs show a bearded man in Arab head-dress with the words "He is bringing change to Saudi Arabia". Passing drivers, unless they are followers of Middle Eastern politics, may wonder who "he" is, but that doesn't really matter. The adverts seem to have been strategically placed so as to be seen by Crown Prince Mohammed bin Salman on his journey from the airport into central London. This kind of thing is a familiar sight in Arab capitals where banners and billboards often greet a visiting head of state but in Britain there's usually less fuss – especially when, as in this case, it's not a State Visit and the visitor is not actually a head of state. In central London, meanwhile. 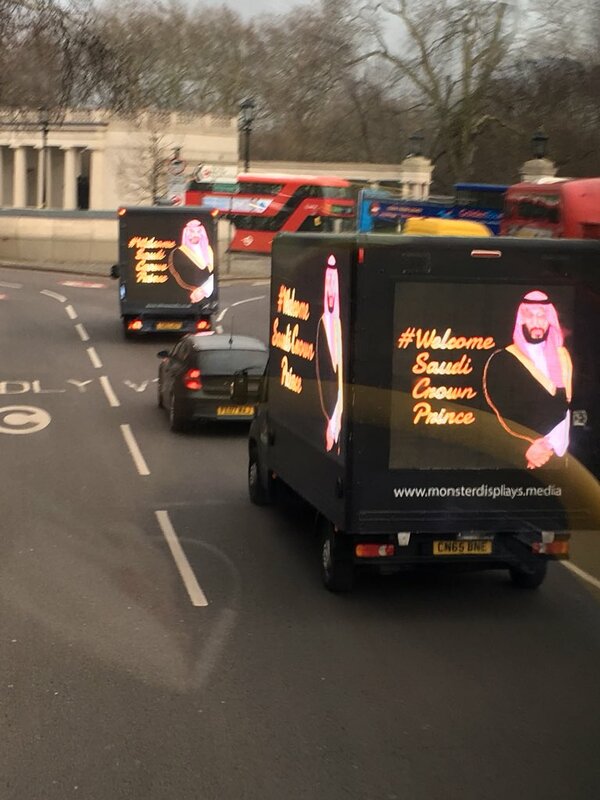 the Monster Displays company has vans driving around displaying pictures of the monster himself and a Twitter hashtag in gold lettering: #WelcomeSaudiCrownPrince. The hashtag, apparently a creation of the Saudis' PR machine, looks increasingly like a bad idea, even when it's written in gold. People have not been responding in the way they were supposed to. "Welcome Saudi Crown Prince!" one tweet says. "Please enjoy the warm hospitality of the British people, expressed traditionally by telling murderous autocrats to piss up a rope." "Naturally you'll be welcome," says another, "because all the members of the British government will be happy to lick your royal backside and do anything you ask for some of your cash." Saudi cash is what it's really about, and with Brexit coming up we are going to need as much of it as we can get – which we'll do by selling the Saudis weapons. "The visit of HRH Prince Mohammed bin Salman ushers in a new era in our bilateral relations focused on a partnership that delivers wide-ranging benefits for both our countries." One of the odd things about this British-Saudi "partnership" is the divergence between government policy and public opinion. While the British government tiptoes around questions of rights abuses and the war in Yemen, trying not to cause offence in Riyadh, the public and most of the media (regardless of political complexion) see no reason to hold back from criticism. During his visit, Prince Mohammed can expect three kinds of welcome: the official government welcome which includes lunch with the Queen, the unofficial billboard welcome that seems to have been organised by the Saudis themselves, and the welcome from the British public (which promises to be somewhat different). Demonstrations against the visit are expected and several buses and lorries with signs denouncing Mohammed bin Salman as a war criminal have been touring London. Today, in an article for the Guardian, the Labour party's foreign policy spokesperson, Emily Thornberry, describes the red-carpet treatment accorded to the prince as "shameless". This might imply a more openly critical approach under some future Labour government, but changes of government haven't made much difference in the past. The problem is that somewhere in the bowels of the deep state there are other forces that come into play whenever there's a serious possibility of an upset in the relationship. The al-Yamamah arms deal, which dates back to the 1980s, is probably the most notorious example. Though massive corruption has long been suspected, attempts to get at the truth have constantly been stymied. When an investigation by the Serious Fraud Office was mysteriously dropped in 2006, one former minister said that even if the allegations were true ending the investigation was the right decision – in order to maintain good relations with Saudi Arabia. A separate investigation by the US Department of Justice also appears to have been tempered by some private lobbying to spare public embarrassment. A more recent example came in 2016 when an all-party committee of British MPs produced a draft report calling a suspension of arms sales to Saudi Arabia in the light of the war in Yemen. A rearguard action led by Conservative MP Crispin Blunt – which involved tabling dozens of amendments and then walking out of the room to make the committee inquorate – ensure that the draft report could not be approved. Mr Blunt could be heard on BBC radio this morning, explaining why the government "is right" to roll out the red carpet for Prince Mohammed.